393 Macaulay Road, Kensington, a Melbourne build-to-rent hybrid. Knight Frank’s Director, Research & Consulting, Australia Paul Savitz, said the findings of the report highlights a growing change in the sentiment of Australians. 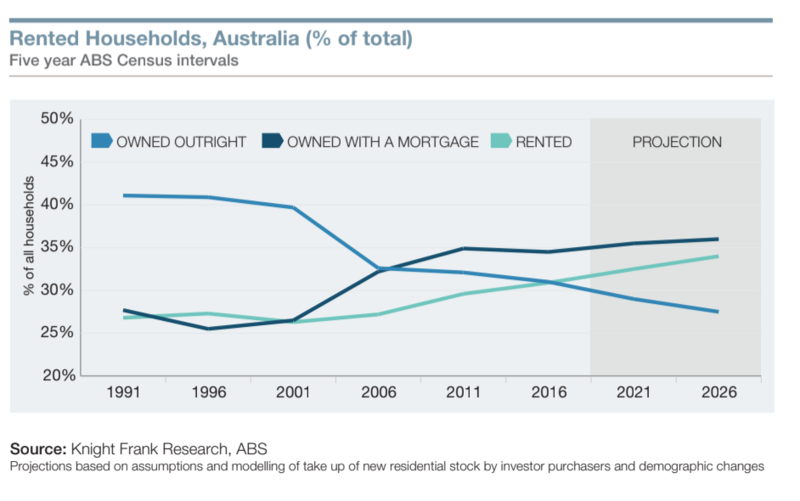 “The survey findings highlight a change of sentiment in Australia away from home ownership and a lean towards renting. It is expected that demand for rented properties in Australia will continue to grow - at the continued expense of those that own their own property outright," Savitz said. With home ownership becoming increasingly unaffordable for a growing number of the population, Savitz says more millennials are opting to rent instead of buy as they are more attracted to the flexibility renting offers. “It is a recognition that people are renting for longer or renting for their entire lives. The institutional investors want continued income; the renter wants a stable place to live," Property Council Chief Executive, Ken Morrison, told WILLIAMS MEDIA. Of those surveyed, 41 per cent rent by choice, while 64 per cent said they expect to still be renting in three years' time. Over the past 25 years, the number of households living in a rented dwelling across Australia has increased by 1,065 million, the equivalent to 42,000 new rented dwellings a year. In comparison, the number of households who own their dwelling outright has increased by less than 270,000 over the same period. For renters aged 34 and under, location was more important than the size of the property. Access to key transport links was a key priority for 30 per cent of those under the age of 34 when choosing where to rent. 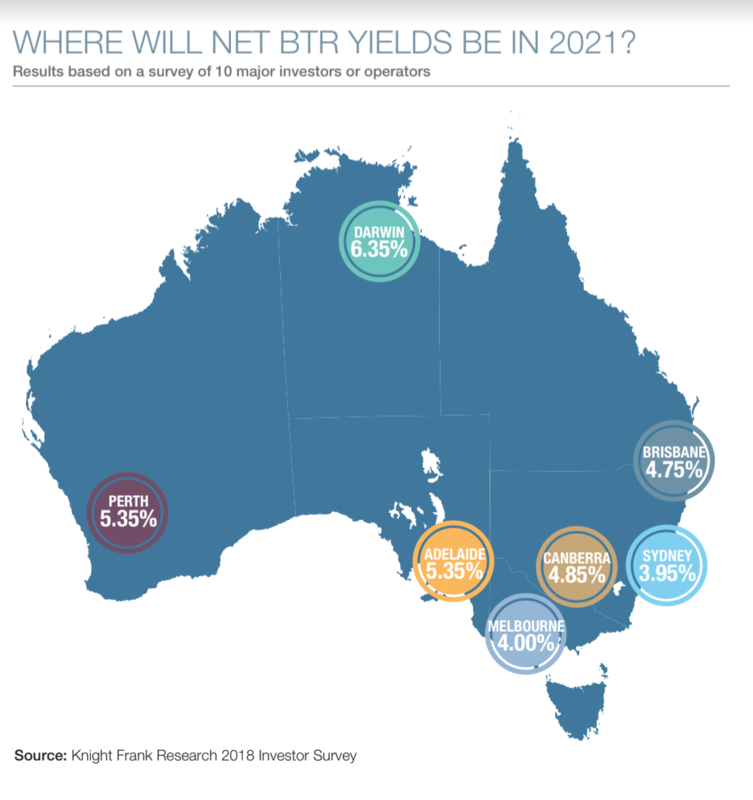 “The counter-cyclical nature of rental demand and the search for higher-yielding investments with a secure, long-term income stream is attracting institutional investors into providing rental accommodation at scale. "Identifying and researching the location, design, specification, amenity and unit mix will be important to maximise efficiency and returns in new build-to-rent developments,” said Savitz. 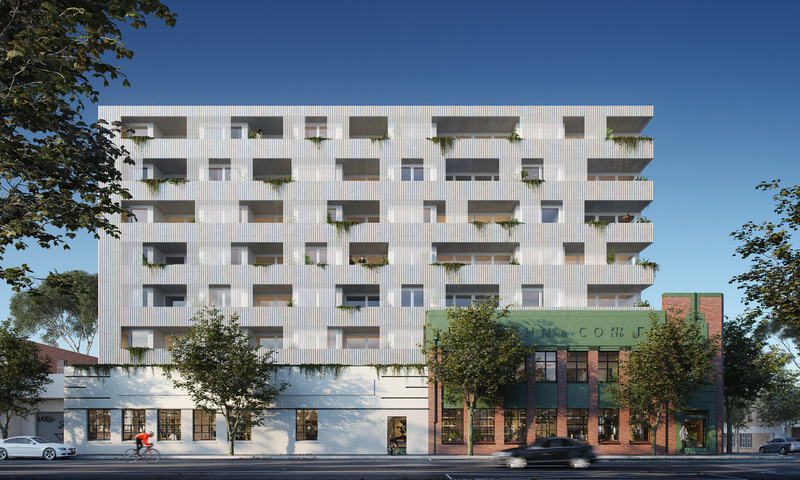 The $60 million pilot project, a 73-apartment development on Macaulay Road in Kensington in Melbourne's inner north, has won support from the ANZ. In the Kensington project, residents sign a five-year lease with the option to purchase their home for a fixed price at the end of the term. The project, if it succeeds, is sure to garner attention, as developers, housing advocates and policy makers around the country are keen to identify the means necessary to establish a build-to-rent sector, as investors are beginning to find the traditional rental market less appealing. "As a sector, the market for rented accomodation is changing. Individual investors are now finding it less appealing, with reduced tax incentives and forecast lower returns, and it is becoming harder to purchase a residential property for investment due to restrictions on lending," Holtsbaum said. “Over the next decade, we expect the emergence of the build-to-rent sector to lead and accelerate the growth and delivery of rented dwellings, financed by institutional capital which takes a longer-term view on its investment return. "The findings in the small sample of Australia’s demand profile mirror that of our findings in the UK, where we survey over 10,000 tenants annually. These results provide further evidence and support that the build-to-rent sector has the potential to develop and thrive as an alternate accommodation sector in major Australian markets," Holtsbaum said. According to Holtsbaum, as the residential sector in Australia ripens, investors, developers and operators will be keen to knowledge share from markets with established build-to-rent platforms. “The US and UK are notable examples of where large-scale investment into build-to-rent has thrust the sector into a mature and desirable asset class – albeit relatively low yielding," Holtsbaum said. Read the Knight Frank research report Multihousing – Tenant and Investor Survey 2018 in full here.